Yesterday’s long legged doji candle in the usd to cad daily chart, simply reinforced once again that the pair are now consolidating in this narrow trading channel between 1.10 to the up side and 1.065 to the downside, and a break to either will signal that the sideways drift has been broken. As outlined in several posts this month for the usd to cad, the tone is still heavily bearish, and we should expect to see a break to the downside in due course, as the pair push lower towards our intial target of 1.05, and then on towards parity once again, and indeed today’s price action to date has certainly reinforced this view so far. 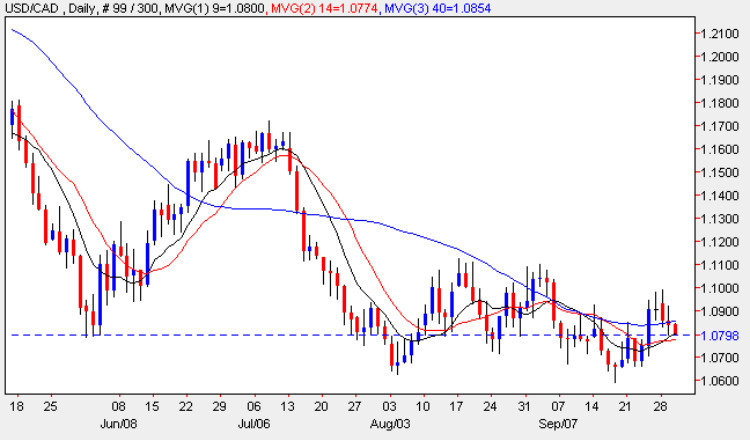 The weak rally of Friday and Monday, ended with a strongly bearish signal of the tweezer top, which was has now been confirmed with a move lower, and the key will be whether the 1.065 price level is able to provide a platform once again for a bounce higher, or whether it simply cracks under the selling pressure from above, which now seems likely. The fundamental news on the economic calendar today has been dominated by two items, one in Canada and the other in the US. Starting with the US, the influential ADP figures came in far worse than expected at -254,000, against a forecast of -200,000 giving rise to the view that the hoped for economic recovery in the US is further away than many had realised, and suggesting that Friday’s Non Farm Payroll data may not be good news for the US dollar, which continued to slide under the weight of an ultra low interest rate, which is causing investors to buy other better yielding currencies and leaving the dollar to play the role of carry trade currency of choice, a position once the preserve of the Japanese yen. Until we see the economic picture improving and the prospect of a rise in interest rates in the US then the dollar is likley to decline further with a consequent fall in the usd to cad pair. The bad news in the US was further compounded by the Canadian data, with the release of the monthly GDP ( the only country to report on this time cycle) which came out worse than forecast at 0.0% against a previous of 0.4%. The other major item of news which tends to affect the Canadian dollar more than the US dollar was the release of the weekly crude oil inventories, which once again showed oil stocks rising at 2.8M against a forecast of 0.5M.